Rossini was considered to be Europe�s most famous composer of the first half of the nineteenth century, lauded far and wide beyond Italy. He was, for instance, received by George IV at the court in Brighton and amassed a small fortune during his time in London in 1824 before arriving in Paris. Such was his fame and influence that Schubert�s stage music was side-lined in Vienna to make way for Rossini productions. It seems incredible, therefore, that his music went into such a steep decline from the closing decades of the nineteenth century to the middle of the twentieth. Little other than The Barber of Seville and a handful of overtures were maintained in the repertoire of those days. This scholarly, extensive overview of Rossini�s operas, liturgical works and piano and vocal works reflects the dramatic turnaround in appreciation that has occurred in the last fifty years or so. Benjamin Walton concentrates on Rossini�s career in France and we note that the Parisians took him so much to heart that the composer was laid to rest in Père-Lachaise, Paris�s grandest cemetery, but later his remains were disinterred and removed to Italy, to Santa Croce in Florence, a temple to the glories of the young Italian nation, modelled on London�s Westminster Abbey. Charles Brauner concentrates on the Rossini revival listing the ever-increasing performances from 1949 to 1990 (By 1989, for instance, Semiramide had had 48 performances and La gazza ladra 21. Brauner comments: "The post-war Rossini Renaissance was slow; at first led, it would seem, not by singers or audiences but by a few dedicated conductors, Vittorio Gui for opera buffa and then Tullio Serafin and Gabriele Santini �" Brauner also details the growing appreciation and re-assessment by critics and commentators and the contribution of talented singers: Renata Tebaldi, Teresa Stich-Randall, Eileen Farrell, Janet Baker, Joan Sutherland and most importantly, according to Brauner, Marilyn Horne. Part II of this compendium is devoted to �Words and Music�. First there is Paolo Fabbri�s detailed examination of the work of Rossini�s army of librettists (often working stably in a specific city), their specialisations, strengths, weaknesses and how Rossini worked with and related to them, and how the libretti were moulded to the capabilities of the singers and the exigencies of the opera plots (by type: Farse, Opera buffe, Opera serie and Opera semiserie, plus, in a special section, French operas). Philip Gossett contributes an article on Rossini�s composition methods, quoting an anecdote � "... implicitly emphasising his sloth, Rossini was said to have composed in bed." � hardly likely considering the composer�s vast and speedy operatic output! The article covers Rossini�s preliminary sketches, skeleton scores and self-borrowings and use of collaborators. Also in this section is Marco Beghelli�s assessment of �The dramaturgy of the operas�, Damien Colas on Rossini�s �Melody and ornamentation� and Richard Osborne�s coverage of the �Off the stage works� from Rossini�s student works and cantatas, through the Messa di Gloria (1820), and Stabat mater, to the songs including the twelve comprising Soirées musicales (1835) and Péchés de vieillesse (Sins of Old Age) and, finally, Petite messe solenelle. A final section has Leonella Grasso Caprioli writing on �Singing Rossini� that gives an insight into the composer�s relationships with, and his expectations of his singers and his predilection for �cantare che nell�anima si sente� (singing that you can feel in your soul). The article includes an annotated list of contemporary Rossinian singer-teachers. Mercedes Viale Ferrero contributes �Staging Rossini� that covers staging conventions and practices in Italy in Rossini�s day: set designs and costumes (great efforts were made to ensure accuracy extending even to sending to England for accurate costume patterns for Elisabetta regina d�Inghilterra, illustrated) The article also includes nine other illustrations of opera sets and costumes including those for Tancredi, Semiramide and sumptuously detailed sets for William Tell and Le Siège de Corinthe. Pen portraits of Rossini�s leading set designers are also included. Patricia B. Brauner concludes with an article on the challenges of �Editing Rossini�. A list of works and a bibliography round off the book. 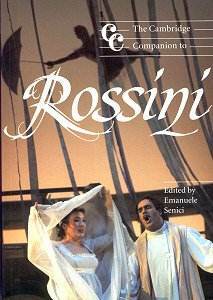 An intensive, yet readable study revealing many facets of Rossini�s art.